Reserve um traslado compartilhado do Aeroporto de Cracóvia e desfrute de um início livre de estresse para sua viagem. 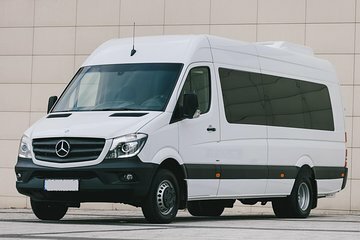 Este serviço de transporte fácil de autocarro leva-o do aeroporto para o seu hotel em Cracóvia, permitindo-lhe passar mais tempo a desfrutar da sua estadia e menos tempo a descobrir a logística de transporte. Another private transfer - excellent value! Lucky enough to get a private transfer! Driver waiting for me at arrivals with a sign and everything. Our driver was a student and extremely personable. We enjoyed our 30 minutes with him. A great introduction to our exceptional experience in Krakow. Very good. Very comfortable bus. Bus driver was not interested in engaging in conversation, but it was a transfer and not a tour. This was a first class service, both to and from the airport. Very friendly and informative drivers - almost guides! Our driver was already waiting for us at Arrivals. The journey into the city was good and we were dropped right outside our hotel. Good service. I would recommend using Viator.